In the Dantean hellscape we now call America, there is a very good chance that either the Zodiac Killer or a botoxed Garfield the Cat impersonator might end up being the next leader of the free world. 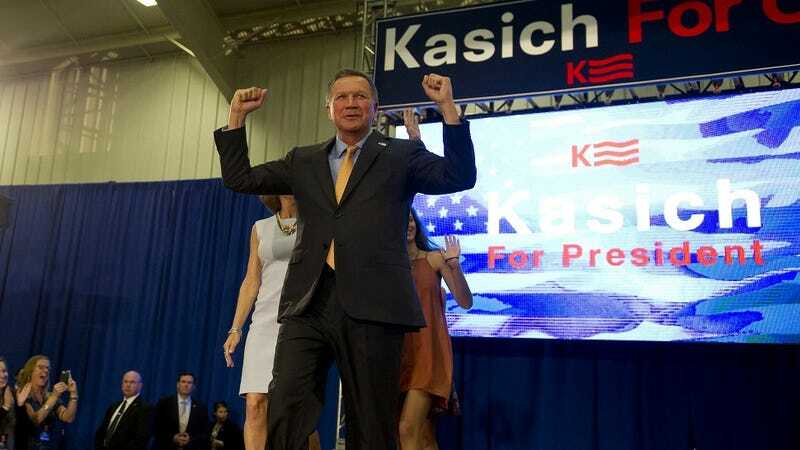 But fellow GOP contender John “The Other One” Kasich is having none of that fuckery, because he’s still in the race, dammit. He won Ohio! Ohio! In video clip from a yet-to-air March 20 interview with Meet the Press, NBC anchor Chuck Todd made the understandable mistake of asking Kasich if he’d run as the vice-presidential nominee on the same ticket with Donald Trump or Ted Cruz. It then became apparent to millions of Internet viewers (i.e., me) that it’s Kasich, not Mark Ruffalo, who is actually the Hulk. The current Ohio governor proceeded to accuse “pundits” of dismissing his campaign efforts, mimicking the haters who question his viability with lines that sound like the first lyrics of my new favorite emo song.